Sacred Heart ,Vashi Soak In The Green! Sacred Heart High School Eco Club is always a step ahead of the crowd.From the get go, they haven't been the backseat drivers but always on the forefront of the environmental movement. With mammoth amount of activities they have undertaken to conserve the environment for e.g the environment policy they have drafted out , recycling of papers etc., these committed young minds are indeed making a change in the world. Also, with the immense help and support from their Teacher Mrs.Nirmala Nair whose always ready to bend over backwards to promote go green movement in the School and go that extra mile! There are so many good things about going to a school where the children take keen interest in the programs that are conducted for them. We at GreenLine especially love it when the efforts of the students are such that they make us want to come over and over again. St. Paul's Convent High School, Dadar is one such school, where we wouldn't mind taking sessions time and again. The girls over here were an excited bunch the last time we came, and this time, their excitement was even more, owing to the fact that those girls who missed the session the last time joined us this time. St.Paul's boys on their way to save water! Following which there was a screening of GreenLine documentary , 'water'. The boys listed out the various concerns with water supply in Mumbai. Then, there was a presentation by Jessica which highlighted the statistics about water shortage and wastage. Next, the boys were given 'My School Saves Water Challenge' by Alden. The boys were all excited to carry out these activities in their Schools. All the best to boys of St.Paul's as they gear up to save water ! The Junior Eco Club of St. Stanislaus School, Bandra, Join in the "My School Saves Water Challenge"!!! Little did JFK know that when he uttered those brilliant words, that there would be children all over the city of Mumbai being just that- actual change makers and possibly the only reason Mumbai will see the light of a better day in future days to come. The reason we say this is because, besides the thousands of secondary school students who are part of the Green Schools, we are slowly but steadily also having a number of sessions with children from younger classes. We earlier did a mixed session for the boys from the 4th to the 9th standard of St. Joseph High School, Wadala. But our last session was exclusively for the students of the Junior Eco Club of St. Stanislaus School, Bandra and it was possibly one of the most positive sessions we have ever had as the GreenLine team. Lonavla's Biggest EVS Club all Set to Save Water! Auxilium High school, Lonavla aboard the green scene! 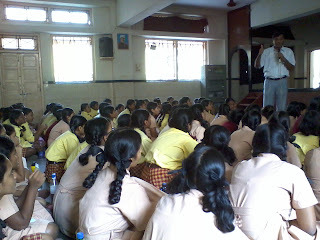 13th December 2011 Team GreenLine had its second session at St. Andrew's High School, Bandra today. The Std. IX boys attended the session. They were one excited lot, with oodles of energy!The session commenced with Fr. 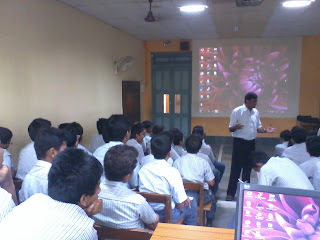 Savio explaining the Green Schools Campaign to the students – the previous session had been attended by Std. X and hence this group was new to the Campaign. He then moved on to the topic for our current session – 'Water' – and engaged the boys in a short discussion on this issue. Next, there was the screening of the GreenLine documentary on 'Water', following which the boys articulated the different concerns surrounding water supply in Mumbai. Jessica then gave the boys a further insight on each of these concerns. Finally, Alden presented the 'My School Saves Water Challenge', which would help the boys to minimize wastage and conserve water in their school, and most importantly, in their Homes. Friday morning saw us heading to St. Anthony's High School Versova, for its first session in this year's Green School's Campaign. The session began with Father Savio introducing the team to the students and the concept of the campaign, and also easing them into the idea of how saving the environment and protecting that which provides life to us, is a good idea. The students here were very receptive to the ideas and suggestions that we made, and it was good to see the level of involvement that these students wanted to show! After the introduction, the children watched with keen interest the documentary on Water, followed by careful scrutiny of the information that Jessica provided for the water statistics of the city of Mumbai. This was then followed by an excited bunch of students getting all set to do all of the water activities that Alden told the students they had to complete in order to be a real cool school! A warm welcome aboard to St.Pius X as they join in the Green Schools Campaign for the year! This school is amidst a clean neighborhood indeed and the Piusites are certainly a boisterous bunch. Fort Convent, Colaba Girls Get Ready to Green South Mumbai! With each school that our team covers in the Green Schools Campaign, we realize one thing: We are witness to the growth of a number of possible environmentalists all over, children who understand that the environment is not something external but something that encompasses us all, each and every day. With the answers they provide and the questions they pose, it really is heartening to see that at least in the younger generations of our population, there are a lot more who believe that Mother Earth is in need of urgent care. One such School that we found no different from this growing idea is Fort Convent High School, Colaba, and as always it was great to be here for a session. South Bombay has a charm of its own. Not only does it boast of its architectural grandeur, but it can also be proud of its natural beauty. Unfortunately, this is rapidly changing. While once that part of Bombay greeted you with its majestic trees and pretty gardens, today it assaults you with garbage strewn sidewalks and suffocating vehicular pollution. No wonder then, that the residents of this area are visibly upset. And not just the adults, even the children are angry that their environment has been so badly destroyed. And yes, they want to put things right. This eagerness to better the environment was more than visible during our first session at St. Anne’s High School, Colaba this afternoon. The 80 or more girls who were present for the session were extremely vocal in their resolve to do all it takes to turn the tide, to stop any further destruction of nature, to put back a smile on the face of Mother Earth. The nature club from St.Anne’s is indeed an amazing one and are already doing their bit to make their school more eco-friendly one. Alden started out the session by asking the students what efforts were taken up by them as a Nature Club since the previous session. The club members listed out number of activities they have carried out to promote the green movement in their school (for e.g. selling cloth bags on the day of Open House and buying Coffee mugs for their teachers so as to prevent them from using paper/plastic cups, visiting the BNHS and Clean up Drive.etc). Dominic Savio Saving up H2O ! Dominic Savio High School is located around ten minutes from Andheri Station but it took us Forty five minutes due to the bustling traffic. But once we arrived at Dominic Savio High School, the distressing experience was a worthwhile one. The boys from Dominic Savio gave an impressive presentation on the waste auditing for their school, their various observations and how they intend to deal with the waste in the future. Our Lady of Good Counsel all Excited about Saving Water! Right outside Sion Railway Station is located the Our Lady of Good Counsel School. One would never ever know there is a school here if not for the hordes of school students once the school bell has rung. For one, it's outside one of the city's most crowded stations, and then there is the intersection that it is at, with a traffic from both the Central and the Western Suburbs, and a skywalk barely five meters outside its gate! Phew! From an outsider's point of view, it would be difficult to understand, that inside it is a whole different world. One can barely hear any of the noise that the crowds outside make, yet there is commotion and excitement all around. Inside, the students are an equally noisy bunch, but that is like any other school anywhere in the world. The nature club from Auxilium High School at Wadala has around 100 members and this is indeed double the amount of members that we usually find in any school. Our second session here began with a presentation from the girls on the Waste Audit that they had conducted, and suggestions on how they would do their best to reduce waste on their part. It was great to see the girls in Auxilium Wadala wanted to introduce certain changes in their lifestyles to make their school more eco-friendly. The GreenLine team added in a few more ideas that the girls could take up and become a zero garbage school. The Nature Club of Don Bosco’s, Matunga was all geared up for another GreenLine session yesterday. The session was regarding all issues dealing with Water Conservation. There was a brief introduction about how water is integral for us. The students gave in their inputs as to why water is a fundamental right for every individual. Then there was a screening of a GreenLine Movie titled “value water’. After the screening, the students voiced out the various concerns, we, as Mumbaikars face with regards to water shortage. Our Lady of Dolours, Marine Lines Has A Water Challenge to Gear up to! There is a little something different about each and every school that we visit in the Green Schools Campaign. Some are extremely huge, with thousands of students, the others not at all that, with only a few hundred students. What amazes us about Our Lady of Dolours School, Marine Lines is that it is so small, your most probably are never going to know there is a school around, until you really look! One of the earlier schools catering to the locals of the area, the Church building is the only real sign that there could possibly be an educational center around here. One thing that definitely separates this school from the rest is the fact that the school is so miniscule, that we do the sessions in the church building instead. The boys at St. Joseph High School are always up for a challenge and this could be seen from the fact that for our session with them today, along with the regular 9th standard students, there were also smaller boys from the younger classes! This school has one of the most comprehensive plans to initiate every student into the Green Schools campaign, and today was no different! It was great to have the younger boys join in to the activities to be done in the school. Due to certain technical difficulties, it was not possible to have the GreenLine movie on water played out. However, both of the presentations went on well, the first being on water issues in the city of Mumbai, and the second a list of all of the activities the boys would be employing to save water in their school. The boys looked as enthusiastic as always to try out the activities and we are sure they’ll do really well in their effort! All the best to the boys from St. Josephs! Don Bosco’s High school, Naigaon Vows to save Water! This was our third session with the students of the Eco club from Don Bosco High School, Naigaon, and the students were enthusiastically looking forward it. The session began with a presentation by the students on the Waste Audit that they had conducted in the school. They focused on the amount of waste generated in the school, waste segregation and recycling. They also pointed out that they have prepared a Compost Pit and have begun putting the wet waste into it. After the presentation, Fr. Savio complemented the students for the good work that they had done, and then proceeded to introduce the next topic, which with regard to water. This was followed by screening of the GreenLine movie titled ‘Value Water’. St Jerome High School, Kashi-Mira take up the “My School Saves Water” Challenge! We found ourselves today at St. Jerome High School Kashi-Mira nice and early for our first session here for the Green Schools Campaign’s second edition. A new entrant in the Green School’s Campaign, the students for the session included boys and girls from the Eighth Standard; all wondering what was in store for this special session. All bright and bubbly, we ourselves wondered what was in store for us. The session began with Fr. Savio telling the students about the Green Schools Campaign, and the work that GreenLine has been doing. He then took them totally into the session by easing them into questions on water, and their attitude towards it. This was followed by GreenLine’s mini-documentary on Respecting and Valuing Water, a look at the city’s water problems, and a number of different outlooks towards the same. The Girls at Auxilium Convent High School Pali all set to Save Water! We were greeted with great enthusiasm from the Girls for our Second Session at Auxilium Convent High School, Bandra. This time around, we had students from the eighth, ninth as well as the tenth standard, unlike the last time where only the ninth participated. Over a hundred girls present, all of them seemed chirpy in their responses to questions we asked on the environment. The session began with an introduction by Fr. Savio on the concept of Water, its importance and the urgency of valuing it better, followed by a GreenLine Movie on various issues we face in Mumbai with regards to water. The girls were quite attentive throughout the movie, and from their reactions, it seemed to have enjoyed it. 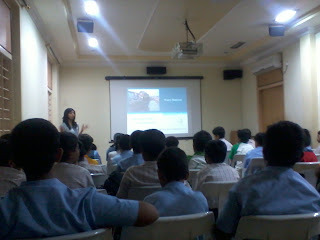 Next there was presentation by Jessica about Water, its wastage and scarcity in Mumbai. The girls were proficient in answering all of the questions asked to them. Liter by liter, Don Bosco School, Nerul to save Water! The student members of the Nature Club at Don Bosco, Nerul always seem excited to do new things on the environment in their school, and always seem more than happy to have us members of the GreenLine Team coming in to give input sessions and new activities for them to complete. The third session that we took with the students saw the same enthusiasm, with children from a number of different classes coming to the session, oven though it was their Open House. The topic for the session was Respect and Value Water, and from the minute we started, we knew we were at a school gearing up for some major water saving.